Ed Kranepool is always referred to the last member of the 1962 Mets to play for the team. While that statement is correct, it's also true that Kranepool was still playing for James Monroe High School in the Bronx when the Mets were taking the field for the first time in St. Louis. Kranepool did not make his debut during the Mets' inaugural season until September 22, just in time to suit up for the fledgling team's 116th loss. Although Kranepool played in each of the club's first 18 seasons, by the time he participated in his first major league game, there had already been 44 players who had taken the field for the Mets, with more than half of them appearing on the team's Opening Day roster. But almost all of the players who were in the Mets dugout during the team's inaugural game on April 11, 1962 were former Mets by the time the team began its fifth season in 1966. Almost. One still remained, and by the time he had played his final game as a Met on October 2, 1966, he had already made quite a name for himself in Mets lore. Jim Hickman - an original Met who was one of the few reasons to feel good about those early teams. James Lucius Hickman was originally signed by the St. Louis Cardinals as an amateur free agent in 1956. Although Hickman showed good pop in the minors, he had trouble collecting hits that stayed in the ballpark. From 1956 to 1959, Hickman managed to hit 86 home runs at various minor league levels, but only hit .266 during his first four professional seasons. Hickman's first .300 season earned him a promotion to Triple-A in late 1960, but a regression to a sub-.250 batting average in 1961 kept him from advancing to the majors. After six seasons bouncing around in the Cardinals organization, Hickman was left unprotected in the 1961 Expansion Draft. He became a former Cards' farmhand on October 10, 1961, when the New York Mets selected him with their 18th pick. A move to an expansion team practically guaranteed playing time at the major league level for Hickman, even though he was the fifth outfielder selected by the Mets in the expansion draft. Starting for the Mets would be a different story, especially after the team acquired future Hall of Fame outfielder Richie Ashburn two months after the draft. Certainly, if Hickman could endure six years in the minors as a patient gentleman, he could also do the same on the bench for the Mets. But he wouldn't need to, especially once manager Casey Stengel gave him his first chance to play all nine innings of a game. Jim Hickman made his major league debut in the Mets' third-ever game on April 14, 1962, appearing as a pinch-hitter for Al Jackson. Hickman popped out in his first at-bat, then went 0-for-2 in his first start three days later before being removed for a pinch-hitter in the seventh inning. Hickman didn't play a full nine innings until the Mets' ninth game. The Mets lost to Pittsburgh to fall to 0-9, but Hickman was the team's hitting star, going 3-for-4 with two RBI. New York finally won its first game the following day, but Hickman went 0-for-4 and was back on the bench for a week. Hickman was used solely as a pinch-hitter until late April, when one big swing in front of the home crowd put him in the starting lineup for good. On April 28, the Mets erased a five-run deficit against the Phillies by scoring six runs in the sixth inning. Although the Mets had taken a 7-6 lead, Philadelphia put two men on base in the seventh and another in the eighth without scoring. Needing an insurance run, Jim Hickman gave the Mets exactly what they needed, clubbing a pinch-hit home run off Ed Keegan in the bottom of the eighth. Hickman's first big league blast gave the Mets the extra cushion they needed, as they held on for an 8-6 victory to earn their second win in franchise history and first at home. The next day, Hickman got the start in center field for the Mets. He rarely saw the bench again. Beginning May 1, Hickman went on a hitting tear, which coincided with the Mets' first (and only) hot streak in 1962. Hickman hit .364 during the first half of May and finished the month with five doubles, five homers, 11 RBI and 17 runs scored in 24 games (22 starts). The Mets won nine of 12 games from May 6 through May 20, but lost that winning feeling as June approached. Hickman, however, continued to be one of the more productive Mets at the plate. Although his final numbers for the year (.245, 18 doubles, 13 HR, 46 RBI) weren't spectacular, they were still among the best on the team. Despite collecting only 96 hits, Hickman was second on the team in doubles and third in home runs. Hickman was also one of just three regulars on the original Mets to post a slugging percentage above .400. Hickman's second season in New York saw him lead the team in various categories and also produced one of a number of "firsts". On August 7, 1963, Hickman became the first player in team history to hit for the cycle, accomplishing his feat against the team that originally drafted him. Serving as the Mets' leadoff hitter against St. Louis, Hickman singled in the first, doubled in the second and tripled in the fourth. The home run, which helped Hickman earn a starting position a year earlier, was all Hickman needed to make baseball history. But after hitting 13 homers in his rookie season and five more in the Mets' first 31 games in 1963, Hickman had experienced a power outage, hitting just four homers in 260 plate appearances from May 13 through his third at-bat on August 7. Facing Barney Schultz in the sixth inning, Hickman made it five homers in 261 plate appearances, as he completed the cycle with a blast off the journeyman reliever. The first cycle in franchise history helped Hickman get back on the home run track, as he swatted eight homers over the next six weeks. The cycle was also one of eight multi-hit games for Hickman in August after he produced just seven such games in June and July combined. Two days after hitting for the cycle, Hickman produced another memorable moment, hitting a walk-off grand slam against the Chicago Cubs. The two-out, ninth-inning blast off reliever Lindy McDaniel turned a potential extra-inning affair into a 7-3 Mets victory, which gave starting pitcher Roger Craig his first victory after 18 consecutive losses - a National League record at the time. Ironically, McDaniel had intentionally walked pinch-hitter Tim Harkness to load the bases for Hickman - the same Tim Harkness who just six weeks earlier had also victimized the Cubs for a walk-off grand slam, the first such blast in team history. "Oh, what a month. Late in the season back in '63. What a very special time for Jim..."
Despite Hickman's strong August, his extended mid-season slump kept his final batting average low (.229), but that didn't prevent him from being one of the team's most productive offensive players in 1963. Hickman finished second on the team in hits (113), doubles (21), RBI (51), runs scored (53) and slugging percentage (.399). He also led the Mets in homers (17) and triples (6) while playing in a team-leading 146 games. Amazingly, despite all the great power hitters and speedsters who have donned a Mets uniform through the 2013 season, Hickman remains the only player in club history to lead the team outright in both triples and homers in the same season. The only other players to lead the team in the two categories - but not outright - were Cleon Jones in 1971 and Howard Johnson in 1989. Jones hit 14 homers to tie Ed Kranepool and Tommie Agee for the club lead in 1971. He also matched Bud Harrelson with a team-leading six triples. Eighteen years later, Johnson led the Mets with 36 homers, but his three triples made him the team's co-leader in that department with Kevin McReynolds and Dave Magadan. Hickman's power was mostly a product of his home ballpark in 1962 and 1963, as he hit 21 of his 30 homers at the Polo Grounds during his first two seasons in the big leagues. But the Mets were moving into state-of-the-art Shea Stadium in 1964, leaving some to believe that Hickman's power wouldn't translate well in the Mets' new home. Those fears were quickly allayed, as it took just 13 at-bats in his new home park for Hickman to hit his first home run, and he couldn't have picked a better time to hit it. The Mets began the 1964 season by playing just 13 of their first 42 games at home, leaving Hickman little time to become acclimated to Shea's dimensions. To make matters worse, Hickman only started three of those 13 home games. But when the Mets returned to New York after a lengthy 15-game road trip on May 29, Hickman was in the team's starting lineup against the San Francisco Giants. Hickman was 0-for-2 in the game when he came to bat in the bottom of the seventh inning. The Mets, who began the frame trailing by two runs, were able to tie the game on run-scoring hits by Frank Thomas and Joe Christopher. Up stepped Jim Hickman, trying to give the Mets the lead for the first time in the game. After Christopher stole second to put himself in scoring position, Hickman took Giants starter Jack Sanford deep with his first Shea Stadium home run - a tie-breaking clout that gave the Mets a 4-2 lead, which would become the final score two innings later. 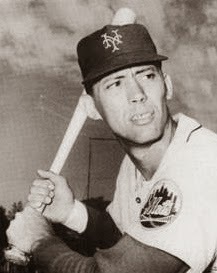 Although Hickman failed to play in 140 games for the first time as a Met in 1964, he still managed to post career highs in batting average (.257) and RBI (57). He also slugged 11 home runs in just over 400 at-bats (six of them were hit at Shea Stadium), allowing him to reach double digits in homers for the third consecutive season. The 1965 campaign was a season of transition for Hickman and the Mets. After spending most of their first three seasons using well-known, but past-their-prime, players to attract fans to the Polo Grounds and Shea Stadium, the Mets started to call up more of their minor league talent. Two rookie outfielders - Cleon Jones and Ron Swoboda - combined to play in 165 games in '65. Along with Joe Christopher, whose breakout performance the previous year (.300, 16 HR, 76 RBI) made it impossible for the manager to sit him on the bench, that left few starting opportunities for Hickman. It took a sad day in Mets history to give Hickman the second chance he needed to turn his lost season around. Through late July, Hickman was having a terrible season. The outfielder was in the starting lineup in only 48 of the team's first 96 games and was batting an even .200 with eight homers and 20 RBI. But when Casey Stengel broke his hip as a result of a fall, Wes Westrum took over as the team's skipper, giving Hickman more starts in the outfield, as well as spot starts at first base. Hickman responded well, batting .276 with seven homers and 20 RBI over the last third of the season. One particular game in early September showed that Hickman was all the way back from his early season doldrums. On September 3, 1965, Hickman was once again facing the team that originally drafted him, the St. Louis Cardinals. Two years after achieving the first cycle in Mets history in a game against St. Louis, Hickman would be the author of another "first" versus the Cards. In the second inning, Hickman got the Mets on the board first with a home run off Ray Sadecki. Two innings later, Hickman struck again, giving the Mets a 3-0 lead with another blast off Sadecki. By the sixth inning, St. Louis had cut the Mets' lead back to a single run, and still had Sadecki on the mound when Hickman stepped up to the plate for his third at-bat. Had Sadecki learned anything from Hickman's first two at-bats against him? Let's just say it was third verse, same as the first (and second), as Hickman launched his third homer of the game to give the Mets a 5-2 lead. The Mets went on the win the game, 6-3, as Hickman became the first player in club history to record a three-homer game. Hickman had a chance to become the eighth major leaguer to sock four home runs in one game, but settled for a measly single in his fourth at-bat. Despite finishing the year with a career-low 369 at-bats, Hickman still managed to hit 15 homers - four behind team leader Ron Swoboda. Hickman also added 18 doubles, which contributed to his .407 slugging percentage - second on the team to Swoboda. A post-Stengel resurgence boded well for Hickman in his quest to return to everyday action in 1966. But an unfortunate injury shattered those dreams, as well as his future with the Mets. From 1962 to 1965, Jim Hickman started 338 games in the outfield, with 240 of them coming in center field. 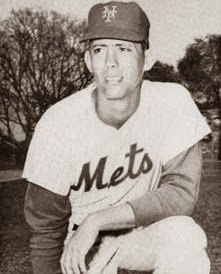 As the 1966 season opened, Hickman had become the longest tenured player on the team - the only player from the original Mets roster to make it to the team's fifth season. Hickman was back to being a regular outfielder in 1966, starting 16 of the team's first 21 games. But a wrist injury kept him out of action for nearly three months, giving Cleon Jones the opportunity to take over the center field position on a full-time basis. Upon his return on August 9, Hickman started just 26 of the team's final 51 games, finishing the year with just four homers and 16 RBI in 174 at-bats. Hickman's injury-shortened season, along with the emergence of Cleon Jones, led the Mets to trade him and Ron Hunt to the Dodgers for outfielder Tommy Davis in November. Hickman played one year in Los Angeles - just as Tommy Davis played a single season in New York - before being traded to the Cubs after a horrendous 1967 season in which he batted .163 with no homers in 65 games. Hickman split time between the majors and minors in 1968, then finally ended three years of injuries and inadequate play in 1969, batting .237 with 21 homers and 54 RBI for the surprising North Siders. A year later, in 1970, Hickman had a season that no one could have seen coming. Prior to 1970, Hickman was the owner of a .236 lifetime batting average and had never scored or driven in 60 runs in a single season. But the new decade brought about a new Jim Hickman, as the slugger set career highs across the board. Hickman batted .315 with 33 doubles, 32 homers, 115 RBI and 102 runs scored for the Cubs in 1970, earning his only All-Star nod and finishing eighth in the National League MVP vote. Hickman's success was short-lived, as he was never able to replicate his monster season. From 1971 to 1973, Hickman averaged 13 homers and 48 RBI, while batting .259. He closed out his career in 1974, after playing one season with the St. Louis Cardinals - the team he tried to make during his first six professional seasons, but never quite made it. When Jim Hickman played his final game for the Mets in 1966, he ranked either first or second in virtually every offensive category. Hickman led the team in games played (624), doubles (78 - tied with Ron Hunt), home runs (60), RBI (210) and walks (167). He also ranked second in runs scored (202) and hits (439), with Hunt leading both categories. Hickman surpassed ten homers in four consecutive seasons (1962-65). The only other player in the Mets' first 20 seasons to accomplish that feat was Tommie Agee, who hit over ten homers in each season from 1969 to 1972. Jim Hickman was known as Gentleman Jim during his 13-year career in the big leagues, not just for his sincere politeness, but because of his humility on and off the field. As detailed by author William J. Ryczek in his book, "The Amazin' Mets, 1962-1969", the Tennessee-bred Hickman always thought he lacked the tools to be the best player he could be, and not all of the tools were physical. "I was 25 when I came to the Mets, and these kids out of the cities were 18 going on 30. It was a hard place to adjust to. I think if I had been a little tougher mentally, I might have been a better player." During the first five seasons of their existence, Jim Hickman was the Mets' most consistent power hitter. He was also one of the team's most dependable run producers, driving in crucial runs for Mets teams that struggled to win. Although Hickman struggled to stay in the starting lineup at times, he still managed to find himself in the right place at the right time for many "firsts". He was the first Met to hit for the cycle and the first Met to hit three homers in one game. (Jose Reyes is the only other player to accomplish both during his time with the Mets.) Hickman is also the only Met to lead the team outright in triples and homers in the same season. And had Tim Harkness not beaten him to the punch, Hickman would have provided the first walk-off grand slam in team history. Hickman was known for a "last" as well, as he was the last member standing from the original Mets who took the field in April 1962. Jim Hickman was more than just a player who was known for several memorable individual games. He was one of the few dependable players the Mets had during their formative years. Before Tom Seaver joined the team in 1967, Jim Hickman and Mets losses were about the only sure things you were going to get as a Mets fan during the team's first half-decade.